Be sure to check the Explorers' Guide to Advising before your visit! Last check -in for advising in the mornings is 11:30am. and last check-in for advising in the afternoons is 3:30pm. During periods of high demand for advising (peak registration), advisors will see students on a walk-in basis during 9am-4pm. Advising hours are subject to change. Please call the Exploratory Studies office in advance before your visit. For TSI questions or to request a TSI Staff Review email TSI@uh.edu. See the University of Houston TSI Overview for more information about the exemption, testing, and remediation process. If you’d like to get in touch with a pre-health advisor, please email uhprehealthadvisor@uh.edu. Areas of Pre-Health Advising for students interested in health careers, as well as for JAMP and HPAC will be on a walk-in basis. Current UH students: To schedule an appointment with the Pre-Health Professions advisor go to the AccessUH page (https://accessuh.uh.edu/login.php) and search for the Pre-Health Professions Advisor, Sara Lee. When you select her as an option you will link to her appointment calendar. You can choose any available appointment slot. You will receive an email confirming the appointment. If you don’t see the PHP advisor option on your AccessUH page, please contact the PHP advisor by email at: UHprehealthadvisor@uh.edu. Incoming students: If you are not a current UH student you will not be able to use the online appointment scheduler. In that case please contact the PHP advisor by email (UHprehealthadvisor@uh.edu) to discuss appointment time options. Exploratory Studies is located in Cougar Village II North, in room N140. 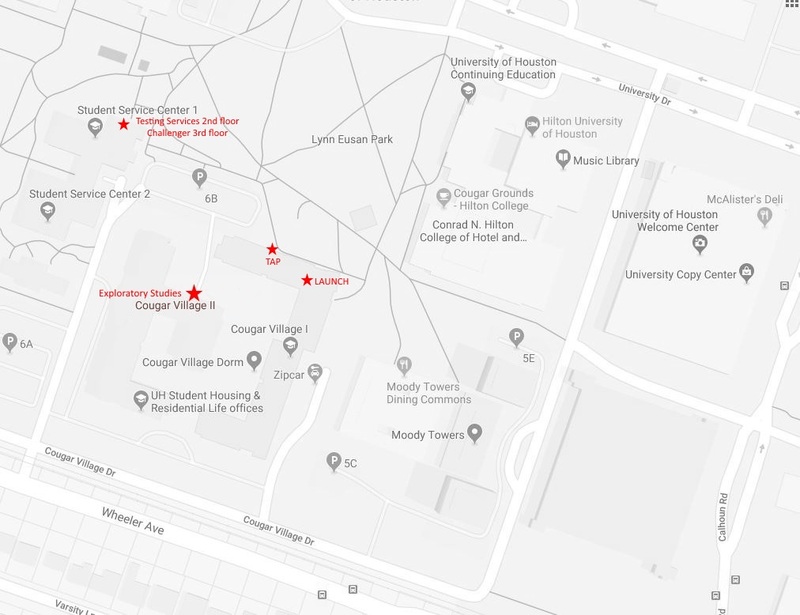 We are located in the first floor, north side of Cougar Village II, just across the lawn from the LAUNCH.